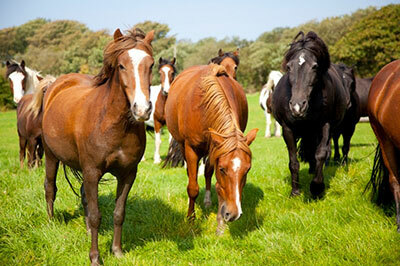 Welcome to the home page of our horse & pony paddock and pasture grass seed mixtures. We are involved in both the traditional and the natural horsemanship market. Our mixes have been designed to give you a wide range of choice. If you are unsure about which mixture click on the advice section below. To get more wild flowers grown we have designed a mix that Horse owners can safely plant in a corner of their field. For every pack of horse paddock grass seed you buy we will send you 25 grams of the mix free of charge (Worth £6.75) The free seed will appear in the checkout when you order. Click on the Link for details of the mix Wild Flower Mix For Horse Fields 25 Grams . Delivery free on all grass mixes! Grass Seed Horse Paddock mix developed by Garry Holter. Offer safe extensive grazing opportunities for horse owners. 10 kilos to the acre if renovating. 15 kilos to the acre if sowing a new pasture. Sow 1 pack per acre. Enter the number of packs you require in the appropriate box and then click "Add to Basket". Grass mix ideal to renovate existing horse paddocks. It will extend the life and improve the quality. Long Term grazing and hay. Contains Herbs and wild flower species.